Nydia Blas is a visual artist living in Ithaca, New York with her two children. She primarily works with photography, video, and books as mediums to explore and present her ideas concerning lived experience, history, and imposed constructs. She holds a B.S. from Ithaca College, and received her M.F.A. from Syracuse University in the school of Visual and Performing Arts. She currently serves as the Visual Media Arts Director at Southside Community Center in Ithaca, NY. Blas delicately weaves stories of circumstance, power, and magic. She uses her work to create a physical and allegorical space presented through a Black feminine lens. It is difficult to acknowledge the way society ignores, limits, and values you and work outside of these confines to create realistic and complicated ways of seeing and looking at oneself that are empowering and propel people forward into new narratives. How do you do this when the very body you reside in is in opposition to what is deemed normal, proper, and worthy of protection? Blas destabilizes far outdated but very real constructs by spinning a counter-narrative as visual evidence of alternative spaces created by the subjects themselves—to reclaim their bodies for their own exploration. Zora J Murff: Tell me a bit about yourself and your relationship with photography. 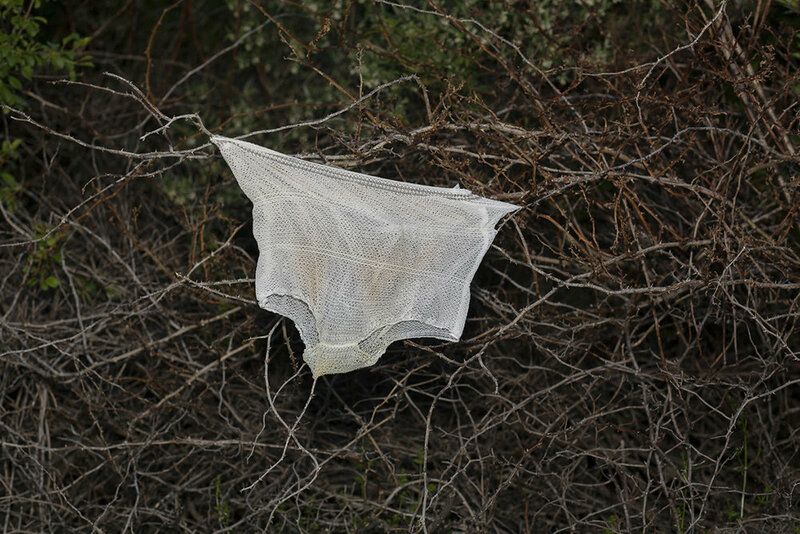 Nydia Blas: I work mainly with photography as a means to speak back to lived experience, history, and imposed constructs such as gender, race, and sexuality. I consider photography as a powerful tool that I utilize as a form of communication. I like to think of a photograph as “momentary output” as they are reflective of what I am thinking and feeling at the time that I construct the image. This is interesting as I am always learning, growing, and becoming new (and hopefully improved) versions of myself. The family homes that I grew up in were filled with pictures of my ancestors and relatives- beautiful brown women, children, and men of various shades- working, playing, celebrating, graduating, etc. In retrospect this worked to instill an inherit (inherent) sense of greatness in me, and in a way the pictures served as proof of this. Currently I live in my hometown of Ithaca, NY with my two children and serve as the Visual Media Arts Director at Southside Community Center. ZJM: Can you talk about your series The Girls Who Spun Gold? 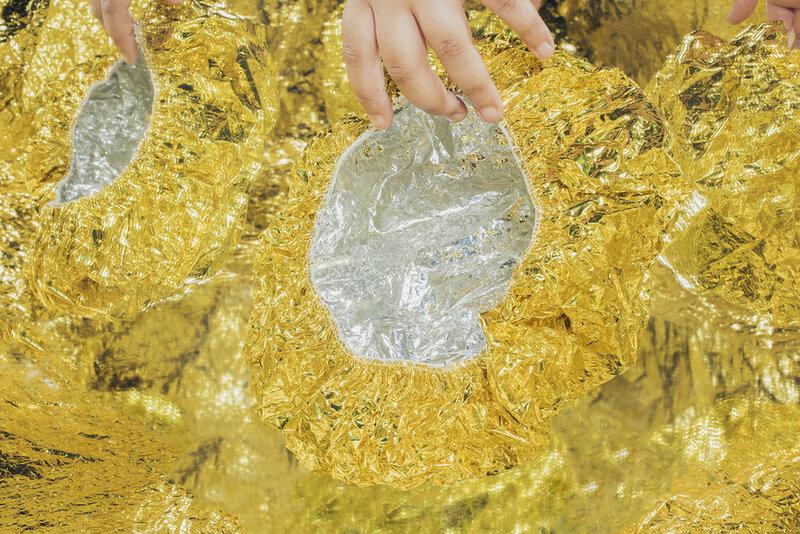 NB: The Girls Who Spun Gold is really a result of so many things, but it is very much inspired by a group of young women that I met while working at a community center before deciding to pursue my MFA degree. We sort of arrived in each others lives at the most serendipitous time, I had just become a single mother of two and they were at the ages that I last remember being a child myself (as I became a mother at eighteen). The decision to begin photographing them was a way to remain connected while also making photographs, teaching, commuting back and froth from Ithaca to Syracuse, being a full-time student, and mother. At some point I felt it was necessary to include myself in the work, so I began making self-portraits. The result is a series of images that work to complicate the notion of what it means to be a girl, a teenager, and a mother. I want the subjects to reclaim themselves, for themselves. I want the images to speak to this intricate process that is painful, messy, beautiful, joyful, etc. The series has taken many shifts and turns. I do not consider it done. Or maybe I do not consider myself done with the subjects, who will undoubtedly inspire me indefinitely. I see this work translating to a video. Piece. Something that is magical, but also rooted in the real world with dialogue and music. ZJM: How you speak about growing up with family photographs in your home reminds me of a sort of “blood” or “genetic” memory. This idea of the past living in present becomes relevant in looking at your work. Did sharing your own experiences with those you photographed help them relate to you? How did that influence the pictures you made? NB: When I first met these girls, I had been a wife and a mother since I was just a little older then they were, so there was something very interesting about the time we came into each other’s lives. I guess I was getting to know myself in a similar way that they were gaining an understanding of the world and who they were. There was an exchange of knowledge, power, and care that took place in an intimate setting (that we worked to create together in a Girl Empowerment Group). That is something that these images are working to communicate. 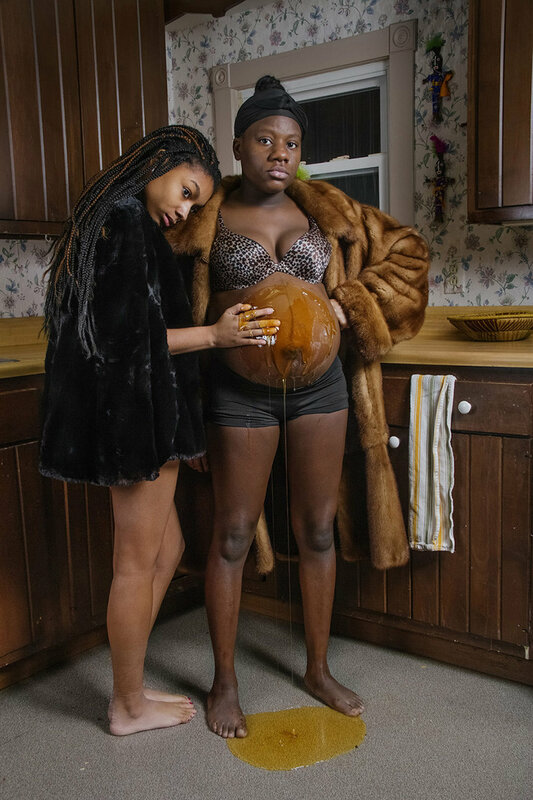 ZJM: There seems to be a lot of deep narratives at play in your images, the most striking one to me is the pregnant young woman with honey smeared on her stomach. Do you borrow mostly from your own experiences? Experiences of those you photograph? Mix the two? NB: There are narratives at play that are both personal and historical. I do reference historical relationships/roles, imagery, and representations. One need not know exactly what these are, but I think the meaning of the images can deepen if one is aware of our complicated and violent history here in the United States, specifically as it pertains to the Black experience. I am continuously fascinated by the ways identities are constructed and how bodies are valued. I work very intuitively; ideas for photographs seem to arrive although I know they are undoubtedly an amalgamation of my own experiences, interactions between people that I have witnessed, things I have read, films, and pictures I have seen. In this way, I often work backwards to make sense of the images I have made. Particularly with this work I felt such a deep connection with these young women that it seemed like our experiences at times were one in the same. ZJM: I feel a tension when I look at your portraits – I’m looking, but I don’t have the right to look. This relationship seems very important to your work. I’m assuming that you were thinking about gaze (especially male gaze of the black female body) in art while making them. Can you talk about this a bit? NB: I was definitely considering the gaze when I made this work. I was contemplating the way that I could dismiss the viewer while also confronting them. How the subjects could be in their own world that is very much about self-discovery while also being aware that they are being looked at. I think this is where the feeling of looking without the right comes into play. I would like the viewer to feel implicated in some way; to become aware of themselves while looking at this work. I think this varies dependent upon who is doing the looking, some viewers will literally see themselves, as women, as women of color while others feel on the periphery as men or white folks. Regardless, I would like the work to spark conversations and pose questions oppose to answer them. ZJM: Thank you for taking the time to speak with me, Nydia.